President Moon Jae-in on Thursday requested Latin American countries to pay greater attention and provide support for containing North Korea’s nuclear program, saying it is not just an issue of major powers, but demands closer global partnerships. Foreign ministers and other senior policymakers from 36 Asian and Latin American countries and international organizations gathered in Busan for a meeting of the Forum for East Asia-Latin America Cooperation. In his welcoming remarks, Moon also called for a boost in diplomatic, business and sociocultural exchanges between the sides to promote shared prosperity and tackle transnational challenges such as climate change, poverty and food and energy security. “The issue of North Korea’s nuclear and missile programs is the biggest challenge that the world faces -- beyond the Korean Peninsula -- and also one that should be resolved through close international collaboration,” he said. The two-day event comes as tensions persist over North Korea’s recent ballistic missile launches. Incepted in 1999, the forum consists of 16 Asian and 20 Latin American member states, including China, Japan, Brazil, Australia, Argentina and Cuba. 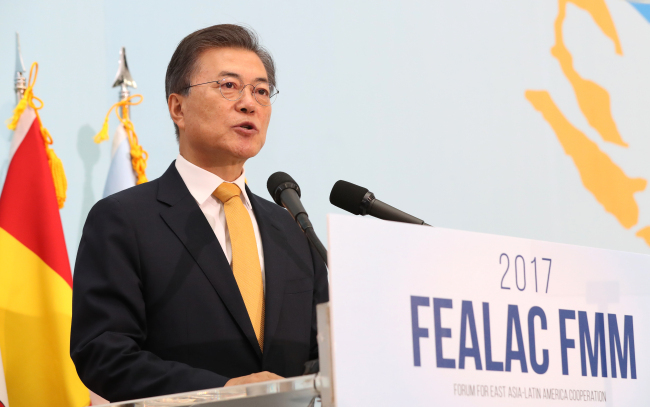 Since 2011, Seoul has been operating an online FEALAC secretariat. Foreign Minister Kang Kyung-wha also sought to drum up support for the Moon administration’s North Korea policy. Latin America is an “ideal partner” as the world’s first nuclear-free zone, she said, while lauding Southeast Asia’s strong commitment to nonproliferation. “North Korea should not be under any illusion that nuclear weapons will guarantee its security. Quite the opposite, if North Korea continues to pursue its nuclear and ballistic missile programs, it will only lead to deeper isolation and economic hardship,” she said in her keynote speech. Kang also called for the members to take “concrete action” to explore the potential for further cooperation especially in five areas -- trade and investment; science, technology and innovation; infrastructure and transport; public policies and public-private alliances for sustainable growth; and inequality and social cohesion.